According to RACER, embattled Formula One team Marussia was this close to a surprise return to the Formula One grid this year. Because it's so late in the development season, the team requested the F1 Strategy Group if they could run their 2014 chassis. That request was just denied. Marussia, now going by the name Manor GP, was exiting administration, which is Britain's form of bankruptcy protection. A statement from Marussia's adminstration firm FRP Advisory confirmed that the team had received extra funding to pay its 2015 F1 season entry fees and was on track to exit administration as a restructured entity later this month. While the final auction of the team's assets was called off at the last minute in January, a number of the team's crucial assets have been sold off already, including much of its equipment and their factory in England. They also still owe Ferrari $25 million for the use of Ferrari's power units and gearboxes. Under-resourced and short on time, the team hoped that they would be able to run their 2014 chassis this year. They asked the F1 Strategy Group today if they could run the old car, which would then go on to the F1 Commission, and then to the World Motor Sport Council for a vote. 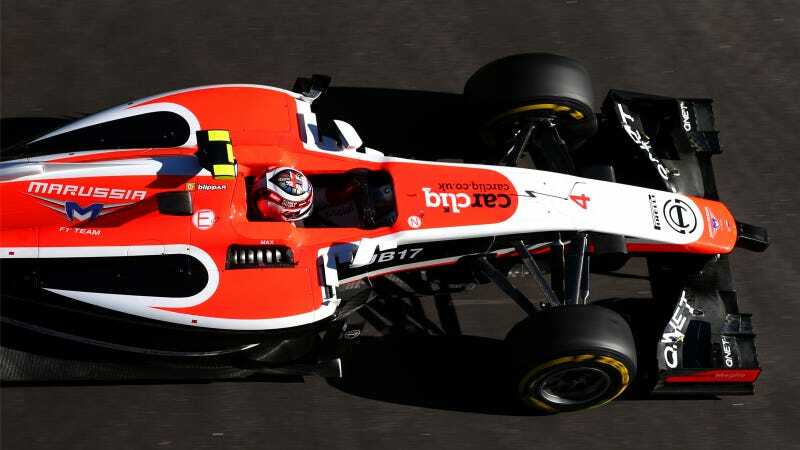 Changes to chassis regulations, such as those regarding the chassis' nose design, mean that Marussia's 2014 car is now illegal, but the team was hoping for an exception. That request for an exception was rejected today. Before the F1 Strategy Group met, RACER put forth the idea that some of the smaller teams who stood to profit from Marussia's forfeited entry would try to block the measure. No Marussia return means that they would get a share of the commercial rights income that Marussia would be otherwise receive. For better or for worse, though, this sounds more like Bernie's doing than anyone else's. According to Autoweek, the F1 Strategy Group consists of the largest teams on a permanent basis—Mercedes, Ferrari, Red Bull, McLaren and Williams—plus the team who finishes next in points. In this case, it's Force India. Each team gets one vote, and Formula One Management (read: Bernie Ecclestone) gets six votes. Bernie has been completely unsympathetic to the needs of smaller teams in the past and today isn't the day he's going to change that. While I'm not a fan of the idea of a team showing up with an out-of-date car that was already a backmarker in the previous year, the upside is that it gets one more team on the grid. UPDATE: Turns out, the "other smaller teams" comment was right: according to Autosport, Force India's vote blocked Marussia's use of its 2014 car. However, because Marussia's exception required unanimous approval, they were the only vote that was needed to block it. A quote from Bernie Ecclestone on Will Buxton's blog, however, indicates that three or four teams were against the measure, so it wasn't only Force India who was against it.